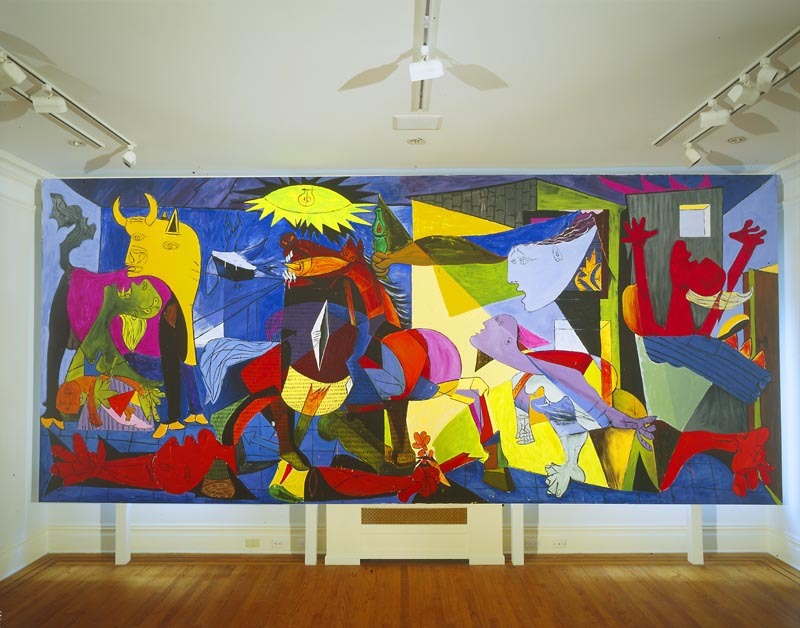 “Sophie Matisse Does Guernica,” the artist’s second show at Francis M. Naumann Fine Art, opens on February 13, 2003. Unlike her earlier show—which dealt with paintings by historically important artists in which figures were removed—the present show concerns itself solely with Matisse and Picasso, artists who are the subject of a major exhibition that will be held concurrently at the Museum of Modern Art in Queens (February 13 through May 19, 2003). In the MoMA show, paintings by Picasso and Matisse are juxtaposed; in the Sophie Matisse exhibition, the highly diverse and—at times—aesthetically discordant styles of Picasso and Matisse are fused in a single image: Picasso’s monumental Guernica, a painting that was made in 1937 (in response to the Nazi bombing of the small Spanish village of Guernica) and today hangs in the Reina Sofia in Madrid. Whereas Picasso’s painting is made entirely in black, white and grays (for he relied upon photographs of innocent victims that he had seen in the newspapers), Sophie Matisse’s rendition of the subject is in shocking color, as if Matisse (the artist’s great grandfather) had taken the liberty of “colorizing” Picasso’s masterpiece. Picasso’s Guernica vividly records the horrors of war, and Sophie Matisse adopts a similarly pacifist stance in her approach to the subject. The exhibition culminates in her 911-Guernica, which presents viewers with a visual reenactment of the horrific attack that took place at the World Trade Center on September 11, 2001, and warns of the dangers that will result should we engage in war with Iraq. Sophie Matisse’s adaptation of Guernica proves that a painting that was made over sixty years ago can still convey a powerful message, one that is charged with new meaning for a modern, contemporary audience.